Split Face Mosaic Tiles are the newest tiles, this made from marble and sandstone, due to rock face it is highly demanded for interior and exterior use. These wall tiles are an incredibly unique products. They are perfect for Boundary wall and exterior design, this tiles can be used in commercial design, as exterior tiles or interior tiles. 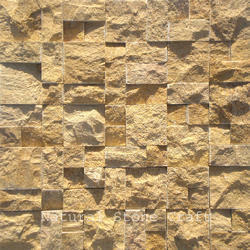 We are indulged in offering the finest quality Mosaic Stone Wall Tiles. We are manufacturer of Mosaic Tiles from Jaipur. We are offering our customers a wide range of Mosaic Wall Tiles, which are available in various specifications as dimensions, sizes, material, color combination etc according to customer's requirement. Our offered Mosaic Wall Tiles are widely acclaimed for high quality & durability, optimum compressive strength and long self life.